Myanmar (Burma) has been on our wish list ever since we first visited Cambodia eight years ago, at a time it was still untouched by tourists. Every year we’ve said “we must visit before it gets as touristy as Thailand”, yet every year something else would come up and we wouldn’t make it. When we decided to live and work in Cambodia for a year it seemed the perfect opportunity to fit Myanmar in as part of our seven-week journey there. We were ever hopeful that since it had started to open up to tourists in 2012 it hadn’t become too busy. 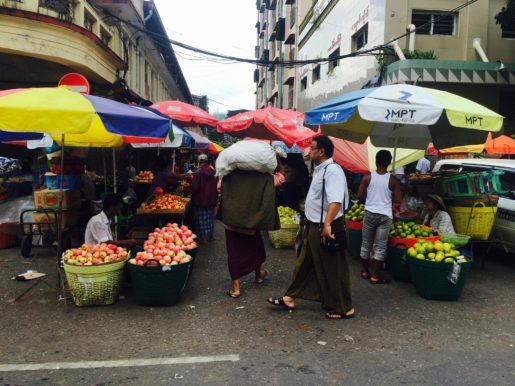 We weren’t disappointed by our first impressions of Yangon, our first stop. We hadn’t done much research on Myanmar before leaving the UK, the same as Bangladesh, as all our research had gone into India. The week before arriving we decided that as we only had two weeks we would pick just three key places. This would mean we could spend a bit more time in each and relax a bit before getting to Cambodia to start working. This was much slower travel than we’d done so far – especially in India. Andy was happy with this as it’s his preferred style of travel, but I wasn’t so keen as I felt we’d be missing out on loads. I changed my mind though when we agreed that we could always come back later in the year to see the things we missed. 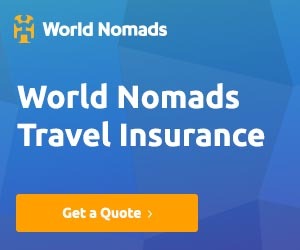 Myanmar is, after all, only a relatively short, inexpensive flight from Cambodia. This 10 to 14 day Myanmar itinerary also covers the places we visited during our time in Myanmar, plus a few extras. Our first stop was Yangon. We finally arrived in Yangon after a long delay in Dhaka airport in Bangladesh. Due to a technical fault, our plane had turned back to Dhaka after only 35 minutes in the air. Over seven hours stuck in one of the dirtiest airports we’d ever been in, was not quite what we’d envisaged. It was typical though, as we were chomping at the bit to leave Dhaka and couldn’t wait to start the Myanmar leg of our journey. Nevermind, you have to take the rough with the smooth. As we’d known from the start, this wouldn’t all be plain sailing. On disembarking the plane, the air felt cooler compared to Bangladesh. Immediately we noticed how clean Yangon airport was. We sped through immigration using our e-visas that UK citizens must purchase online in advance and collected our bags. Such efficiency was a complete contrast to the airports we’d experienced in India and Bangladesh. The driver sent by the Lotus Bed and Breakfast we’d booked was waiting for us in arrivals, he looked relieved to finally see us. I’d been updating them of our arrival time by email, but I think the poor chap had had his plans changed several times that day. The roads were quiet as we drove from the airport towards Downtown Yangon. This was due to the late hour of the evening and there wasn’t much to see in the dark. Until that is we spotted Shwedagon Pagoda, the biggest pagoda in Myanmar. It shone bright gold against the night sky in the distance. We planned to visit it the next day and also the night before we leave Myanmar. Apart from that, there wasn’t much to see at that time of night. Something strange we noticed during the drive was that the steering wheel was on the right-hand side of the car (the wrong side), but we were also driving on the right-hand side of the road. Apparently, most cars in Myanmar are like this as they are imported from Japan where they drive on the left. We arrived at Lotus B&B and from the outside appearance, my heart sunk a little. The entrance hall looked quite scruffy and I began to have visions of a repeat of that awful first hotel in Mumbai. Once inside though we were pleasantly surprised. It wasn’t anything fancy but it was clean and functional and the staff were welcoming and helpful. Having dropped our bags off we headed straight out just after 11 pm to find much-needed food and beer. Following a suggestion from the B&B staff, we took a short walk to 50th Street, a cafe, bar and restaurant. They told us it was one of only a few places serving food and beer until midnight. As we walked through the nearly deserted streets I saw several huge rats scurrying about. I’d heard there is a prolific rat population in Yangon but didn’t expect them to be that big. 50th Street is a well restored colonial building located on…yes you’ve guessed it – 50th Street. 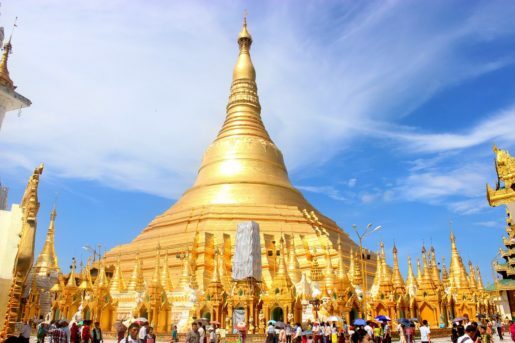 It’s located just outside the busy Downtown Yangon. As we entered we saw it was a spacious, well restored colonial building. Later we found out it’s also one of the longest established Western-style establishments. It’s also supposed to be an expat haunt and has pretty good wifi (for Myanmar). We were keen to try a local dish but the menu was mainly Western. 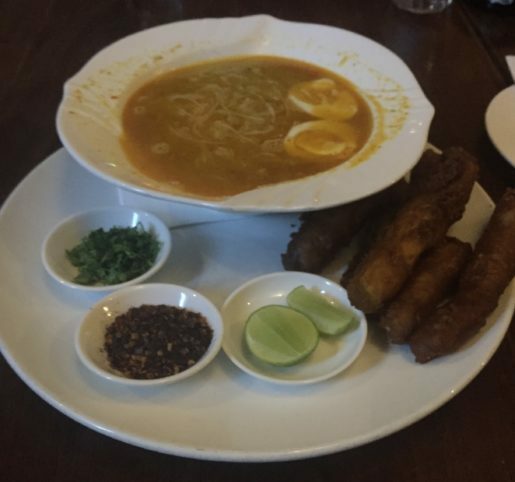 Luckily one of their specials that day was Mohinga, a traditional Myanmar dish. Many people consider this to be the national dish of Myanmar. It’s usually served on a smaller scale for breakfast. 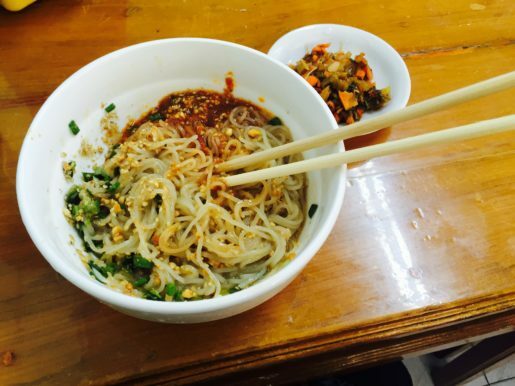 It was a delicious fish broth ladled over rice noodles and slices of hard-boiled egg. It was served with a side of deep-fried gourd sticks, and condiments such as chilli flakes, coriander and lime, to add to taste. We got chatting to a couple of Aussie blokes in the bar. This gave Andy some much needed male conversation after three weeks of meeting no other travellers. Knowing the bar closed at midnight we consumed several ‘Myanmar’ beers in quick succession. The Aussies knew of another bar that was likely to still be open, so we all wandered a bit further down 50th street to the Fat Ox. It was difficult to find as the sign lights were off and the windows tinted. A British expat ran the bar and it was pretty dead, but fine for a late drink. We all had several more before calling it a night at about 3 am and wobbling back to our B&B, tired and tipsy. After we’d had another yummy Mohinga for breakfast at the B&B, one of the staff gave us a map and pointed out some key sights for us. For the third country on this adventure, it was ‘integration and assimilation’ time. We needed to find our bearings and get into the swing of things. As always this would involve wandering around, to see what we could find and to familiarise ourselves with this new country and how things work. We set out on foot to explore, the first thing we noticed was it was much quieter than India and Dhaka. It became clear this was because there were no motorised auto-rickshaws constantly beeping their horns. The drivers of most vehicles here seemed to have much more decorum. There was still some scary driving about but they were much less liberal with their horns! The only modes of public transport in Yangon seemed to be taxis that could be hailed from the street, buses that had seen better days, and trishaws. Trishaws are three wheeler cycle-rickshaws, designed to take two passengers sitting in opposite directions. They seemed to have been built for small people though so I think one person per trishaw would be much comfier. As we strolled down the busy streets we noticed many of the women and some children had some sort of gold/ white paint on their faces and occasionally arms. I wondered if it was for religious reasons but soon discovered it was actually Thanaka – a cosmetic paste made from ground Thanaka tree bark mixed with water. It is considered to enhance the beauty of those wearing it and also protects from the sun. We saw cuttings of the bark on sale on the roadside and on market stalls. Most locals wore longyis made from a tube of fabric and fastened in different styles for men and women.. The women’s were made of pretty, colourful fabric, tied at the side and worn with a close fitting matching top. They were quite flattering. The men’s longyis were darker colours, patterned with checks, stripes or plaid. They were tied in a big knot at the front and worn with button-down shirts or t-shirts. We also noticed many people were using umbrellas as sun parasols, a good idea as the hot sun was beating down. Something else that was obvious was that the habit of chewing betel nut or paan was widespread here. Red spit-spattered the paths and roads and many of the friendly smiles contained red stained teeth. First stop was Sule Pagoda, a golden Buddhist stupa which doubles up as a roundabout. We had a quick look round, removing our shoes first and ensuring my shoulders and knees were covered. This is the norm when visiting temples in Asia. There were signs up everywhere displaying images of the clothing rules for the pagoda. Sule Pagoda’s location was central and a perfect start to our exploration. We spent a while after that just wandering looking at sights and soaking up the atmosphere. On some corners we noticed street vendors selling tiny birds in cages, these were ‘luck-birds’, a Buddist tradition. From what I could gather the belief is freeing these birds earns ‘merit’. I couldn’t see the logic of trapping and caging birds to then release them, but then who am I to question another’s tradition. We also passed several colonial style buildings, such as the Independence Monument and the City Hall. All that walking in the heat had made us peckish so we popped into Lucky Seven Tea-shop near Independence Monument for a quick snack. I had a tasty bowl of Shan Noodles, whilst Andy went for Vegetable Soup, they were both great. Next up was Bogyoke Aung San Market in Central Yangon. It was a sprawling under-cover market selling just about everything you can imagine. The main focus though appeared to be traditional arts and handicrafts. If you’re in a shopping mood or are after some souvenirs then you could lose yourself here for several hours. Unfortunately, I wasn’t feeling it that day. Much as I love markets I just wasn’t in a shopping haggling mood so we only had a quick look. I’d like to come back another time to spend more time browsing. The sky looked as if it was threatening rain so we bought an umbrella each. We’d been thinking about getting some for a couple of weeks but kept deciding against it. Everyone seemed to have them here though so we gave in, by the end of the day we were pleased we had. We pottered around the street’s a bit longer looking at roadside vendors and stalls selling all sorts. Tables overflowed with phone accessories, chargers and adapters, colourful fruit and vegetables, fish, dried fish and prawns. There were also several tea stations dotted about with locals sitting sipping steaming glasses of green tea. I took over the map reading and we set out in the direction of Shwedagon Pagoda (or so I thought). After a while, it became apparent my map reading skills weren’t up to scratch that day. I’d taken us in completely the wrong direction…oops! Despite using our umbrellas as parasols we were too hot to keep walking so we hailed a taxi. Twenty minutes later we’d moved all of about 100 metres, lesson learned, rush hour in Yangon is not the time to be getting a taxi anywhere. We got out and continued on foot. I took over the map reading and we set out in the direction of Shwedagon Pagoda (or so I thought). After a while, it was clear my map reading skills weren’t up to scratch that day and we were headed in completely the wrong direction…oops! Despite using our umbrellas as parasols we were too hot to keep walking so we hailed a taxi. Twenty minutes later we’d only moved about 100 metres. Lesson learned, rush hour in Yangon is not the time to be getting a taxi anywhere. We got out and continued on foot. The sky behind Shwedagon Pagoda became black and angry as we approached, this just emphasised the gold even more. I managed to get just one photo before my phone died on me, annoying as there were some great photo opportunities inside the pagoda. At the entrance to the pagoda, shoes had to come off and I had to cover up with a shawl again. Andy was wearing shorts so he rented a longyi to wear.There were signs up everywhere with pictures depicting the clothing restrictions in place. At that point, those black storm clouds opened and dumped buckets of rain down on the pagoda and us. Out came the brollies again, we were so glad we’d bought them! There were non-slip plastic mesh runners rolled out over the main walkways, which was good as the tiled floors were treacherous in the rain. Both of us nearly went flying a few times when we veered off the non-slip parts. I’m sure there must have been some nasty slips and trips there over the years. Admission to the pagoda is 5,000 kyat (£3.20 GBP) for foreigners, but free for locals. Despite the rain, the pagoda was full of locals milling about, meditating and praying, including lots of monks and some nuns. There were also a few other Western tourists. Despite the large numbers of people, it didn’t feel crowded as it was massive. We only stayed about an hour because of the rain, but you could kill a good couple of hours or so exploring all the different parts to it. After a quick freshen up back at the B&B – we set out for the evening. We wanted to check out China Town, in particular, 19th Street where we’d heard there were lots of barbeque street food stalls, beer stations and buskers. It was supposed to be pretty lively in the evenings. The entrance to the 19th Street was pretty much surrounded and hidden by a night market. The colourfully dressed vendors were selling all types of food. There were lobsters, crabs, fish, herbs, and fruit and vegetables, some things neither of us had seen before. To be honest we enjoyed watching wandering around the market stalls more than 19th Street. We had a quick walk up and down it and stopped at one beer station for a quick beer, but for us, we just didn’t find it that impressive. 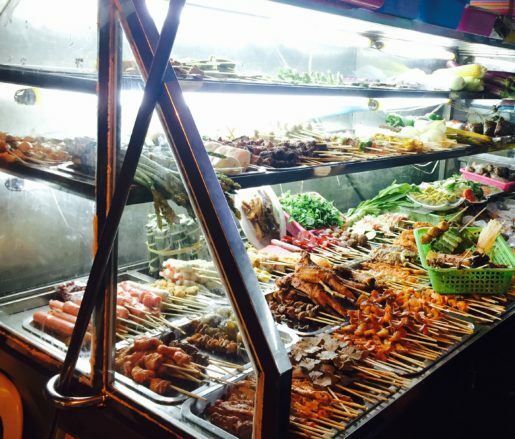 I think we’d been spoilt by our visit a few years earlier to Jalan Alor, the famous street food market in Kuala Lumpar, 19th Street, just couldn’t live up to it! We finished the evening back in the Fat Ox as it was Sunday and not much else going on. We also had a pizza craving to satisfy. Since visiting Yangon fellow Cambodia expat and travel blogger Elise from Travel, Work, Play has shared this nightlife tip (I wish I’d known this when we were there) – For incredible night time views of the Shwedagon Pagoda which is lit and glowing in the evenings, head to The Thiripyitsaya Sky Bar – on the 5th floor of the Sakura Tower. Not only can you see incredible views of Yangon and its pagodas, but you can enjoy some delectable beverages at this upscale wine bar. International wines are available, as well as wines from Burmese vineyards! Recommendation – the Red Mountain Sauvignon Blanc from their winery near Inle Lake. I had planned to do the Circular Train the next day. However a couple of expats had said it was nothing special, so I decided against it and opted for a lie-in instead. I later regretted missing it though as generally, I usually prefer to form my own opinions. I’ll save that one for our next visit, along with the self-guided colonial walking tour. Our first interactions with Myanmar and its people definitely lived up to our expectations. People were friendly, food, drinks and taxis cheap, and there are some great sights and lots to do to keep you occupied. I also loved how colourful everything is. Another attraction of Yangon was there didn’t seem to be the scams we fell for in India; even the expectation of tips didn’t seem so commonplace. I think the fact that the tourism industry is still relatively new here adds to the charm, maybe this will change soon, but I hope not. We left Yangon eager to see what Bagan and Inle, the other two destinations on our itinerary in Myanmar would have in store for us. We’d also have loved to explore the ancient cities around Mandalay, but that would have to wait for another trip. 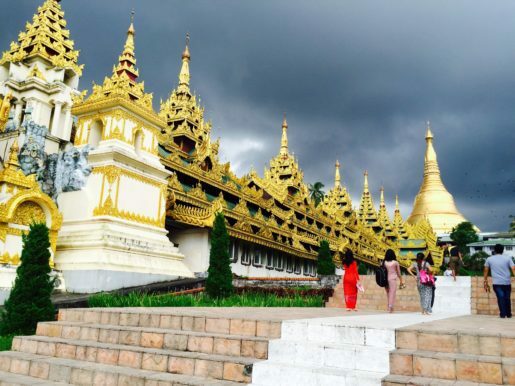 Have you been to Myanmar and was Yangon your first stop? How did you find it? Although it wasn’t my favourite country in Asia, I remember how amazingly nice the people in Burma were and the temples in Bagan were incredible. I’m glad you guys enjoyed Yangon and I look forward to hearing what else you got up to. Yes they really were friendly, what is your favourite country in Asia? We have a few more to check out hopefully this year!